For those who have ever coached hockey at the youth level, it can be a frustrating process teaching the fundamentals of the game. Kids generally don’t like doing drills at practice. All they ever want to do is scrimmage and go off in their own little world. Therefore showing them the right way to do things can be a challenge. Many of you probably recall coach Gordon Bombay taking his Mighty Ducks to the North Stars game in the original Disney movie, right? Well, for local Bay Area hockey coaches, taking players to watch the Sharks is highly recommended. Not just for the kids to see their favorite team live, but to remind them to closely watch No. 57 whenever he is on the ice. 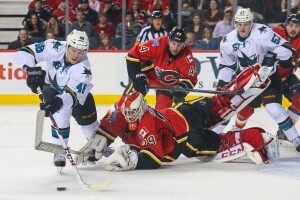 Fifty-seven in teal is none other than Sharks forward Tommy Wingels. And yeah there are a number of more naturally talented players on the San Jose roster, but there is no better example for kids to emulate on the ice. He plays the game fast, hard, but responsible. He forechecks, he backchecks, he finishes his checks. He never cheats towards offense, he never gets too cute, he never takes too long of a shift. 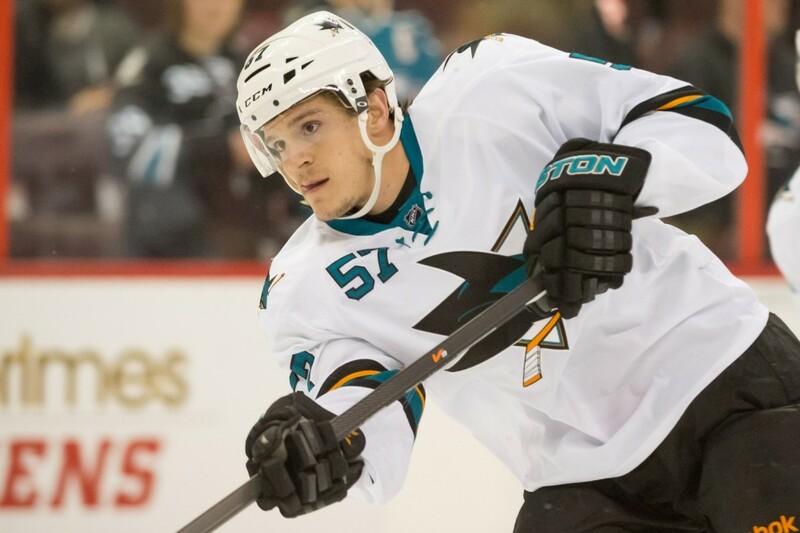 On two very noticeable occasions last season Wingels came to the bench for a change and the teammate replacing him immediately scored with the fresh legs against a tired opponent. He is the first to stick up for his teammates, but plays with discipline at the same time. While fighting in hockey is on the decline and probably should be eliminated for player safety concerns, Wingels willingness to stick up for Tomas Hertl is a lesson in taking one for the team. Obviously fighting itself is not a message to send to our youth players but putting your teammates first is a life lesson, not just a hockey one. In the first game against the Los Angeles Kings after Tomas Hertl suffered this dirty knee on knee from Dustin Brown, Tommy Wingels asked Brown if he wanted to answer for his cheap shot. Wingels didn’t retaliate with a cheap shot of his own, nor did he instigate a fight. He did it the right way, the gentlemanly way. Fighting isn’t an easy thing to do, getting punched sure isn’t fun but Wingels is always willing to put his own well being on the line for his teammates. Not only does Wingels stick up for his teammates by putting his body at risk in terms of fighting and blocking shots, but he plays in every situation. Even strength, power-play, and penalty kill, he knows where he is supposed to be at all times and gets rewarded with that ice time. Rarely does he ever get caught out of position. There is a popular notion in hockey that if you take care of your own end, good things will come offensively. Wingels’ style is the epitome of that type of mentality. He constantly talks about doing the right things, he never seems to worry about whether he is scoring at the offensive end. Players that aren’t strong at killing penalties, that aren’t known for being good defensively, they don’t get to pick up short-handed goals. You can see on the second replay in the above clip that Wingels starts out deep in his own zone and reads the situation develop. He doesn’t jump the gun and leave the zone early, he has the patience to read and react without getting greedy. He also carries himself off the ice the way a professional should. Drafted in the sixth round, 177th overall while playing at Miami of Ohio, Wingels was never a lock to stick in the NHL. His hard work however, landed him a cup of coffee at the highest level during his first professional season in 2010-11. Wingels played five games with the Sharks that season. The following training camp I got a chance to interview him for the first time in what was still my first calendar year as a credentialed reporter. Like Wingels, I was still very new to my environment, and rather nervous about interviewing. I will always remember after that interview Wingels asked me for my name. At the time it hadn’t occurred to me that an NHL player would care what this shy 19-year-old reporter’s name was so I recall being extremely giddy that one of the Sharks players wanted to know my name. But that’s just the type of guy Wingels is, looking out for everyone on and off the ice, no matter who they are. Thus far this year, Wingels is having a second straight season with a huge jump in offensive production and it couldn’t happen to a better guy. Last year he set a career high with 38 points and this year he is on pace for nearly 60 points. He is still doing all the little things and getting rewarded for it with goals and assists. If there is one Sharks player for your kids to watch and listen to, you would be wise to make it No. 57. If i were an NHL coach, my dream would be to clone Tommy Wingels 11 times for my forward lines.